Had a chance to taste some handmade whisky fudge by Gardiners of Scotland, a company famous for Scottish fudge and traditional confectionery. 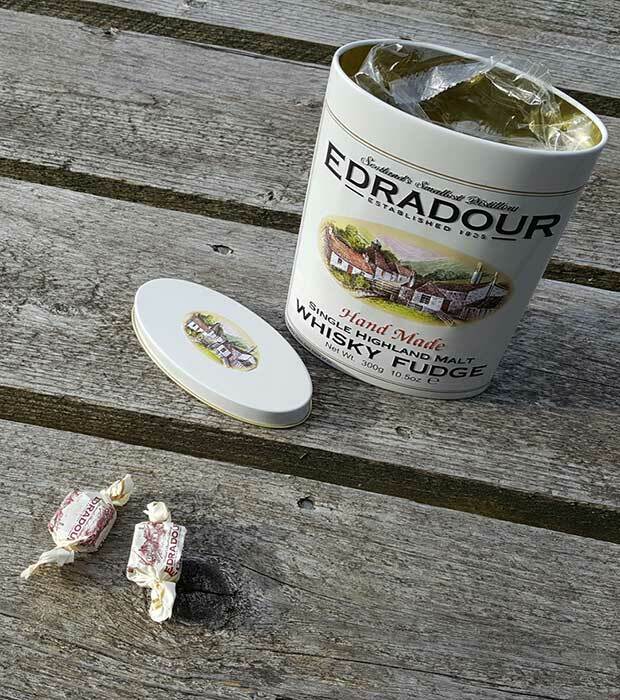 They’ve manufactured delicious fudge laced with Edradour Highland single malt whisky and presented in a protective oval gift tin. Package size is300g/10.5oz. I’ve tasted whisky chocolate and whisky sausage, both from Finnish producers. But this was my first whisky fudge experience. And even though the taste of whisky really didn’t come up in this product, Edradour Hand Made Whisky Fudge still is some darn good toffee. The package is great – tin can with vintage style label, which is actually the same style they use in their 10 year old single malt package and label. Edradour is the smallest distillery in Scotland, established in 1825. Taste: Well, what can I say. It tastes like fudge, premium creamy toffee. The single malt is very hard to spot – the portion of malt whisky is just a bit too small. But there’s no denying that this is good fudge. Even though the whisky experience was left short, I don’t mind. That’s why I have a cabinet full of whisky! Ingredients: Sugar, Glucose Syrup, Sweetened Condensed Skimmed Milk, Vegetable Fat, Edradour Malt Whisky (1%), Flavouring, Salt. Allergen Information: This whisky fudge contains milk derivatives and it may contain nut traces.